The preparations of “International Sufi Conference” which will be held in the Ramlila Maidan in Delhi, are in full swing. In this regard, Delhi’s Imams, Islamic scholars and clerics and teachers of the representative delegation of the AIUMB met the Founder and President Syed Mohammad Ashraf Kichhowchhawi. The meeting was organized today by All India Ulama and Mashaikh Board (AIUMB) in its headquarters in Delhi. This assembly was aimed at reviewing and revising the strategies and ongoing preparations of the “International Sufi Conference”. Both Islamic clerics and teachers developed an action plan to work faster and more accurately and efficiently for the inception of the 4-day World Sufi Forum, of which the last day will be a Declaration Day, entitled “International Sufi Conference”. The board’s founder-president said that there are some baseless misunderstandings and allegations against the World Sufi Forum’s agenda that are being made publicly by some “ill-intentioned elements” with their “ulterior motives”. Though this has caused an unfavorable situation, however, he averred, it’s time we better pay heed to the future historical accomplishment of the conference. This will be the “befitting retort” to the ill-designed agenda and “flimsy rhetoric” of those anti-Sufism elements. He added saying that in the wake of the World Sufi Forum, AIUMB will take up such measures that can alleviate the deteriorating intellectual situation of the Muslim community. “For over a decade, the Indian Muslims too have been forcibly steeped in the same conventional thinking that breeds the grounds for victimhood narratives and conspiracy theories”. “We have to look within, introspect and learn from the mistakes that we have, consciously or unconsciously, done in the past. This is the only way we can get through this turbulent phase of the time”, he further said. Speaking at this assembly, Syed Mehdi Mian Moini Chishti, the custodian of the holy shrine of Ajmer Sharif expressed his ideas on the contemporary relevance of the World Sufi Forum. He said: “This conference is the pressing need of the time. Sufis have been the main bearers of the social cohesion in the domain of religion. But it is deplorable that their religion today is being conflated in media with divisive acts and thought due to the handiworks of the extremist and religo-fascist elements. Syed Alamgeer Ashraf (President, AIUMB Maharashtra) stressed to focus on the universal messages of Islam in both the Sufi conference and seminar as part of the World Sufi Forum. Other Ulama and Imams who came attend this meeting also expressed their views. They unanimously agreed to the desperate need to revive and rejuvenate the Sufi tradition to mitigate the rising tensions across the world. “The concept of unity in diversity has been evolved by India’s Khanqahs, Sufi hospices and shrines the world over, most particularly in the Indian sub-continent. As the different harmonious Sufi orders and silsilas blossomed, a global recognition of the Indian composite culture gained momentum”. These ideas were expressed by Maulana Syed Mohammad Ashraf Kichchawchchvi, who will be opening the World Sufi Forum on March 17, which will continue for four days in a succession. The World Sufi Forum will present papers on the theme: “Sufism: Seeking to Resolve Global Crisis” during the next two days, 18th and 19th March, in different seminar halls allocated to both English-Arabic and Urdu writers as well as in separate sessions for both male and female scholars. At least 100 articles will be read out in different sessions in separate conference halls. March 20 will be the prime time for a huge gathering at Ramlila Maidan. For the Muslim organization, which is an apex body of Sufi Sunni Muslims in India, All India Ulama & Mashaikh Board, this event is going to be documented in history as a first gathering of its kind in India. 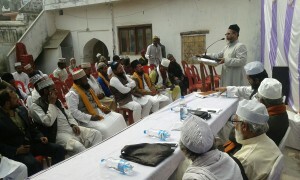 Maulana Syed Mohammad Ashraf Kichchawchchvi urged the peace-loving people of India to come in large numbers to attend the gathering at Ramlila Maidan. Talking to media persons, he explained that the international Sufi conference is going to be a significant step in the whole world, not only for Islamic scholars, Sufi masters, clerics, intellectuals, academicians, teachers and writers but also for all the common masses who will turn up to participate. 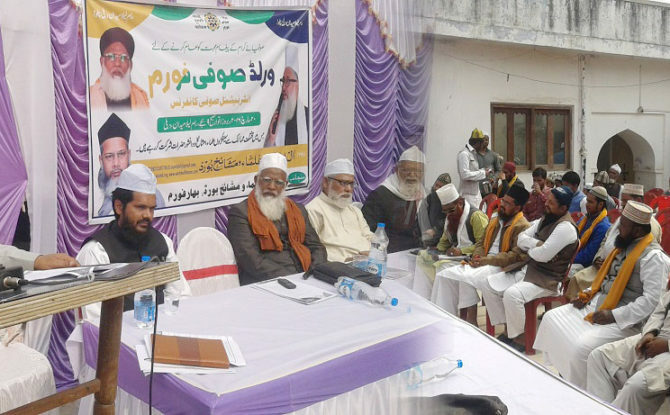 Haji Nuruddin Mansoori (President Anjuman Husainia) said that Hazrat Maulana Syed Mohammad Ashraf Kichchawchchvi is also concerned about promoting modern education along with religious education in the Muslim community. He has chalked out the grand plan of the World Sufi Forum after much of serious thought over the worsening condition of Muslims in India. In this meeting, Haji Sarfaraz, Guddu Abbasi, Khursheed Bhai, Muhammad Rumi, Shakeel Ahmad and many more people were present. 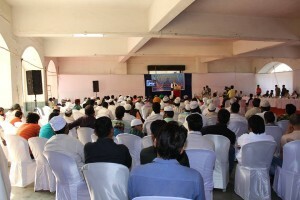 A substantial number of people are expected to participate as volunteers in the World Sufi Forum. 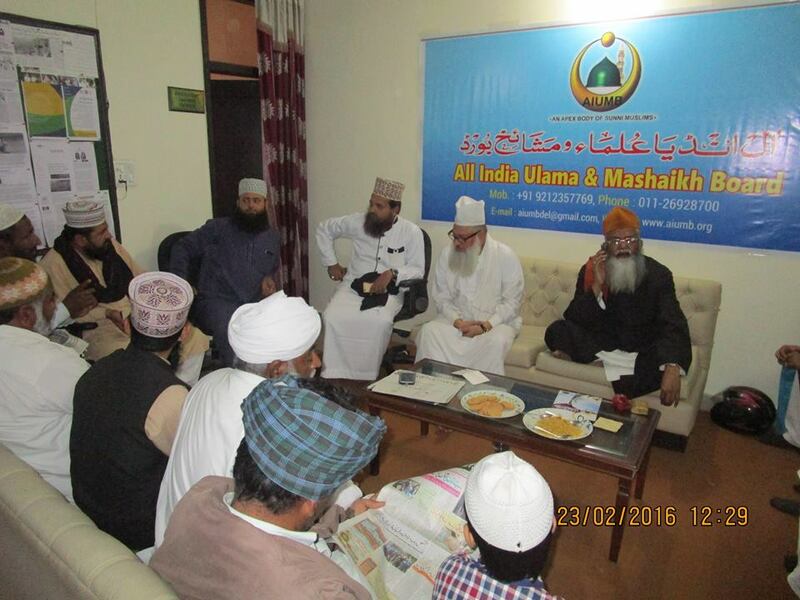 All India Ulama and Mashaikh Board has heightened World Sufi forum preparations in order to organize 4-day international Sufi event. 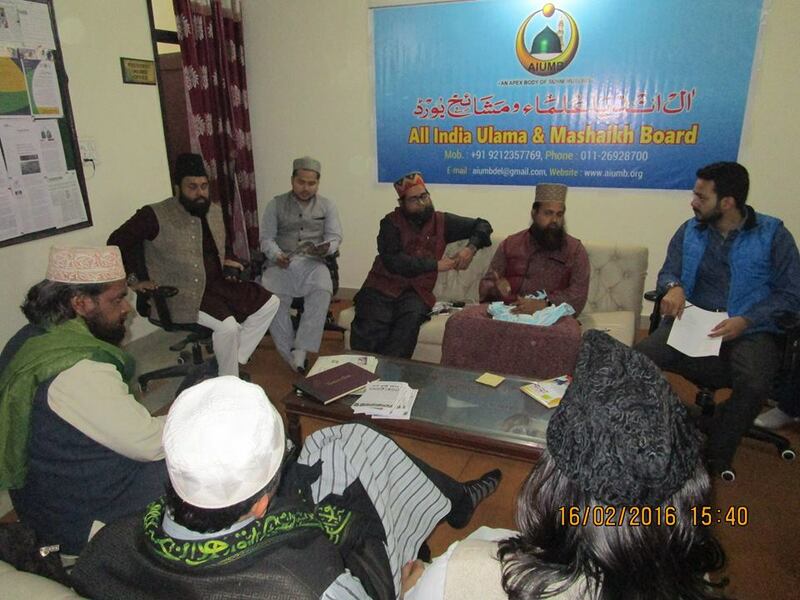 In this regard, a preparatory meeting, chaired by Maulana Syed Sibtain Haider, the National Vice President of the Board, was held at the headquarters of the All India Ulama and Mashaikh Board (AIUMB head office). The meeting was aimed to review the activities and preparations that have been made so far. It is noteworthy that Hazrat Syed Muhammad Ashraf Kichchawchchvi envisioned the inception of the WorldSufi Forum to stimulate revolutionary thinking and exchange of ideas on the promotion of peace and counter-extremism within a spiritual Islamic framework. Maulana Syed Sibtain Haider said that we need to accelerate the work, as the days of world Sufi forum are approaching fast. However, he said, we must greatly consider complete peace, tranquility and brotherhood in all this process. Syed Tanvir Hashmi, President Karnataka shared valuable inputs about the management of the Event. He shared his expertise about an event of this magnitude. As he has been a vital part of the AIUMB team who have successfully organised previous conferences of AIUMB. He also advised the organising team to take care of minute issues also. Syed Hasan Jamee (National Secretary, AIUMB) said that the paper works of the seminar as well as the conference are in the final stage. He thanked and appreciated all his colleagues for the work they have done and encouraged to accomplish whatever is yet to be done. He also emphasized certain matters of concern that need to be paid greater attention at this juncture. 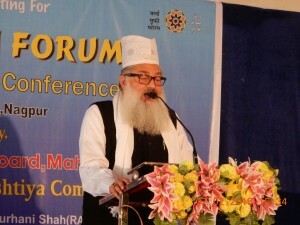 Maulana Syed Aalamgeer Ashraf, President AIUMB Maharashtra said that many works have been done for the successful accomplishment and influence of the World Sufi Forum on the local level. 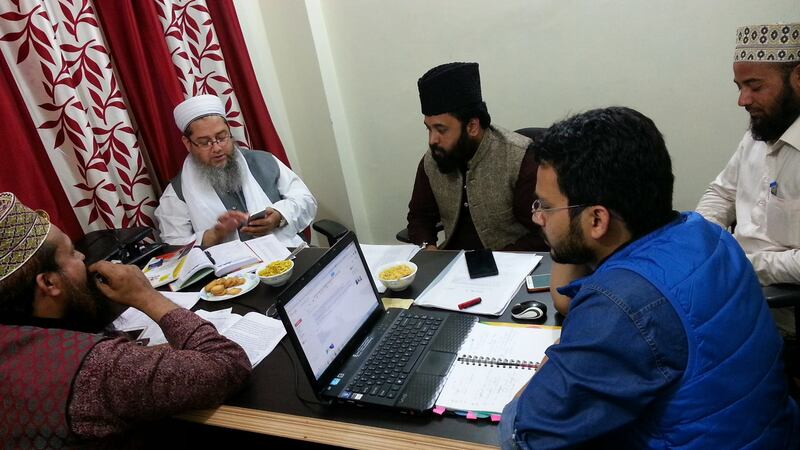 Many new volunteers offered their services to ensure the grand success of World Sufi forum. Their details have been submitted to the local offices. The Central Office shall determine and prioritize the necessary voluntary services in different fields as suited to them. Syed Farid Nizami (Vice-President of AIUMB Delhi Unit) commented on the situation in the capital, Delhi in this regard. He said that the capital of India including the entire nation is desperately waiting for the 20th March when the world fraternity of Sufi Mashaikh, scholars, leading ulama and imams will share an international Sufi stage comprising over 200 Ulama and Mashaikh in the Delhi’s Ram Lila Maidan. Therefore, all the AIUMB members and volunteers in Delhi are actively engaged in preparing for the WSF event, he said. 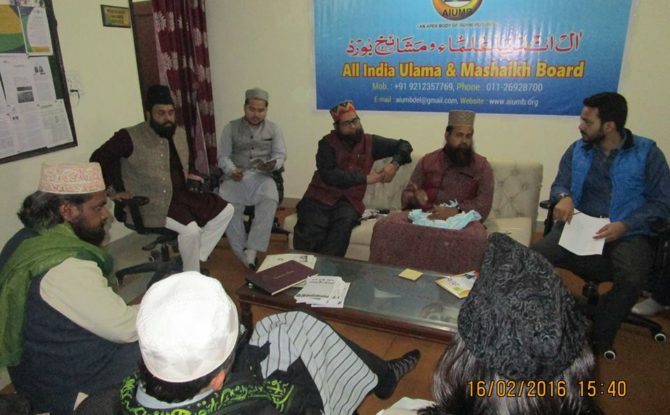 Maulana Abdul Moid Azhari, the office secretary of the AIUMB, said that “it is our pleasure that we have been receiving prompt acceptance of our initiations that we extended to international Sufi delegates”. He added saying: “The seminar will be attended by prolific writers, veteran journalists and well-renowned Islamic scholars and academicians who already consented to present their papers and articles on a variety to topics related to the main theme: “Sufism: Seeking to resolve the Global Crisis”. Both national and international scholars and writers have been invited to attend the seminar. He also said that the papers will be published in book form which will be brought out during the World Sufi forum. In this preparatory meeting, Maulana Khushtar Noorani (Editor, Jam-e-Noor, Urdu monthly magazine), Ghulam Rasool Dehlvi, Mohammad Ahsan office in charge of the AIUMB Lucknow unit, Maulana Hasnain Ahsrafi, Mahfooz Khan, Talib Hussain Khan, Mohammad Hussain Raza Khan and other members of the AIUMB were present. आतंकवाद के खात्मा के लिए उलेमा व मशाइख ने कमर कसी: AIUMB-Bihar. The essential and inherent message of Islam is peace and security and it is guaranteed, not only for the Muslims but also for all other adherents of faith traditions, including even those who follow none. Allah sent the Prophet Muhammad (peace be upon him) as “mercy” for all worlds. Therefore, it cannot be denied that there is zero tolerance for terrorism in Islam. These opinions were expressed by Maulana Syed Mohammad Ashraf Kichhouchhwi, president and founder of All India Ulama & Mashaikh board (AIUMB). 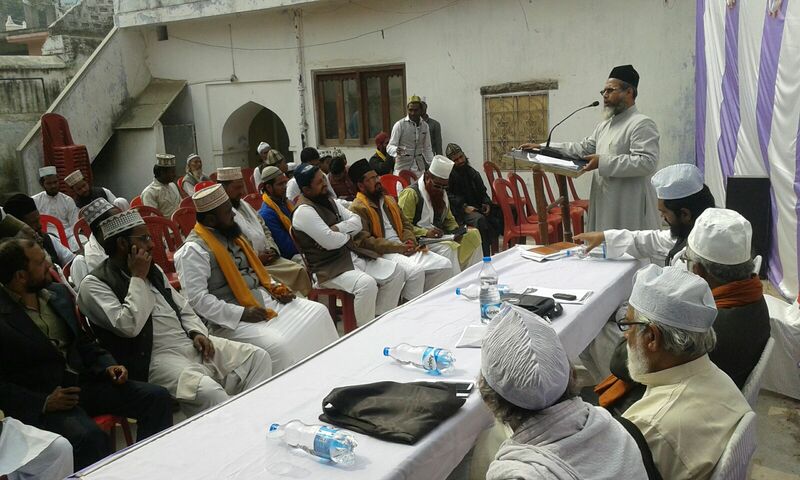 He was addressing Muslim Scholars Sufi leaders and the Islamic clerics in an AIUMB Meeting held by the Markazi Julus-e-Chishtia, in Nagpur. It’s an unfortunate phase of the time in the today’s history that the terrorists are playing havoc across the world in the name of Islam, he said. “Whether it is in Syria, Iraq, Sudan, Saudi Arabia, Afghanistan, Pakistan, Bangladesh elsewhere in the Muslim world, the extremist jihadists have certainly caused major distractions and irreparable loss of human life and dignity”. “Heinous crimes and completely ungodly acts are being perpetrated in the name of God, which go completely against the true spirit and basic tenets of Islam. One such core ethic of Islam is that taking the life of a single innocent is a crime against all humanity (Quran 5:32)”, Maulana Syed Mohammad Ashraf Kichhouchhwi said. 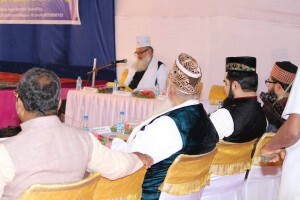 Addressing this important meeting organized by the Markazi Julus-e-Chishtia, Nagpur, the founder and president of the AIUMB, further Syed Mohammad Ashraf Kichhouchhwi said that this meeting was held in preparation for the World Sufi Forum on 17-20 March, which will include an international seminar and a grand-level public conference in Ram Lila Maidan onMarch 20. Syed Mohammad Ashraf Kichhouchhwi further intimated that “This International Sufi Conference and the World Sufi Forum will bring together Indian Sufi scholars, imams, Ulama, Mashaikh and intellectuals with nearly 40 Islamic scholars, Ulama and Sufi Mashaikh representing Bangladesh, Sri Lanka, Singapore, Malaysia, China, Turkey, Canada, Syria, Arabia, Africa, Australia, the United States of America, and the UK”. “Sufi Scholars from the prominent Islamic University, Al-Azhar Shareef, Oxford, Harvard, California and professors from the University of Cambridge and Canada will also be present. Thus, a mixed gathering of Ulama and scholars from the around the world will get tighter in an effort to discuss different aspects of the current situation and build a strong framework for the solutions”. 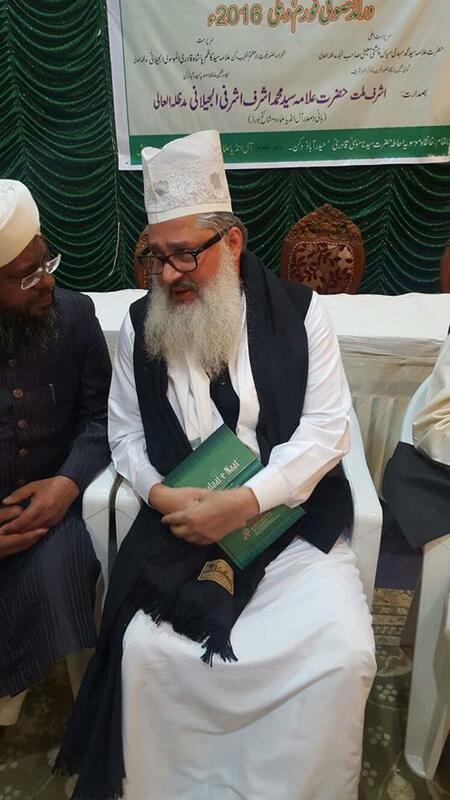 Maulana Syed Alamgir Ashraf (provincial president of Maharashtra AIUMB) said that All India Ulama and Mashaikh board is against terrorism of all forms. He added saying that “the Board aspires to foster the universal Islamic values by spreading peace, brotherhood and unconditional love. 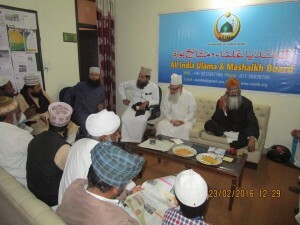 Sufi Ulama at the board, he said, are striving to guide the life of Indian Muslims in the democratic structure of the country. Speaking at the meeting, Haji Salim Ashrafi, Chairman the Markazi Julus-e-Chishtia Chhattisgarh appreciated the dedicated efforts and activism of the Board in preaching the values of peace and pluralism and eradicating the vices of violence and social distress. He said that there is no place for intolerance in Sufism. 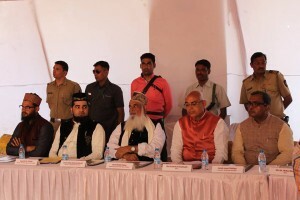 Sufi M K Christi (Gujarat Minority Commission Chairman), Syed Mu’az Ashraf, Grand Mufti of Maharashtra Mufti Abdul Qdeer Khan, Mr. Abdul Rasheed Qalandar, Maulana Nadeem Rizvi, the Siratun Nabi committee chairman Abdul Hasan Taji, Abdul Razzaq Taji, Mr. Faisal Rangun Wala, Mr. Firoz Sheikh, Mr. Kamil Ansari, Haji Sohail Patel, Hanif Patel Ashrafi. 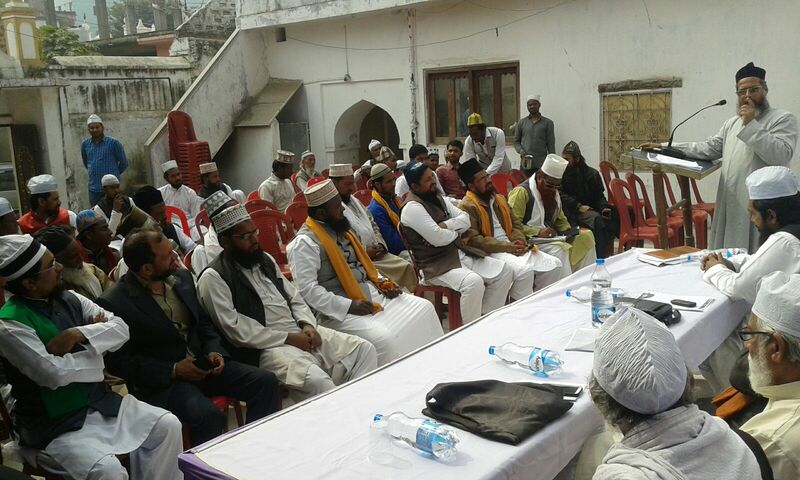 Besides them, many ulama, Mashaikh, Imams and intellectuals were also present in large numbers. 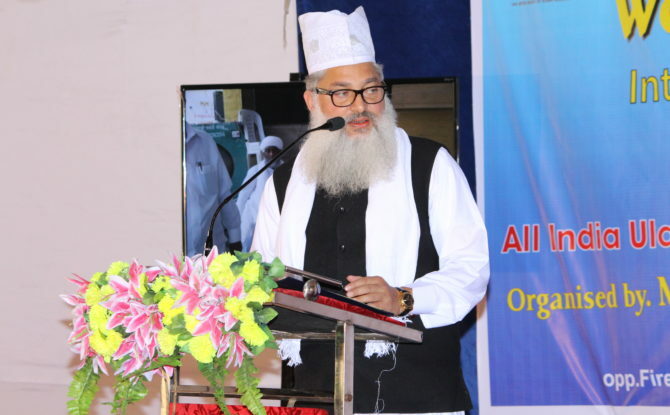 “The rising violence in the name of religion, radical and non-tolerant ideas can only be combated by the Sufi precepts and practices”, said Maulana Sajid Hussain Misbahi, President, All India Ulama & Mashaikh Board, Burdwan. Maulana said that the AIUMB is trying to spread the same peaceful Islamic message through various activities and humanitarian works inspired by Sufism. Maulana Sajid Hussain Misbahi was addressing a mixed gathering of Muslim scholars, intellectuals and Ulama in a meet held in Madrasa Tahzeebul Islam, Sri Pur, Bardawan. In his address, Maulana Misbahi conveyed to all the people that the World Sufi Forum is going to organize the International Sufi Conference under the aegis of All India Ulama & Mashaikh Board. Speaking about the International Sufi Conference, he intimated that it will be held in the Ram Lila Maidan on 20th March, 2016 at 09:00 o’clock in the morning till 04:00 in the evening. 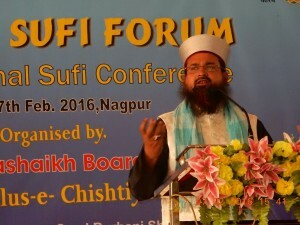 “This International Sufi Conference and the World Sufi Forum will bring Indian Sufi scholars, imams, Ulama, Mashaikh and intellectuals altogether with nearly 40 Islamic scholars, Ulama and Sufi Mashaikh representing Bangladesh, Sri Lanka, Singapore, Malaysia, China, Turkey, Canada, Syria, Arabia, Africa, Australia, the United States of America, and the UK. Sufi Scholars from the prominent Islamic University, Al-Azhar Shareef, Oxford, Harvard, California and professors from the University of Cambridge and Canada will also be present. Thus, a mixed gathering of Ulama and scholars from the around the world will get tighter in an effort to discuss different aspects of the current situation and build a strong framework for the solutions. The meeting started with recitation of the Holy Quran and ended with the Salat-o-Salam (recitation of peace and blessings on the Prophet PBUH). 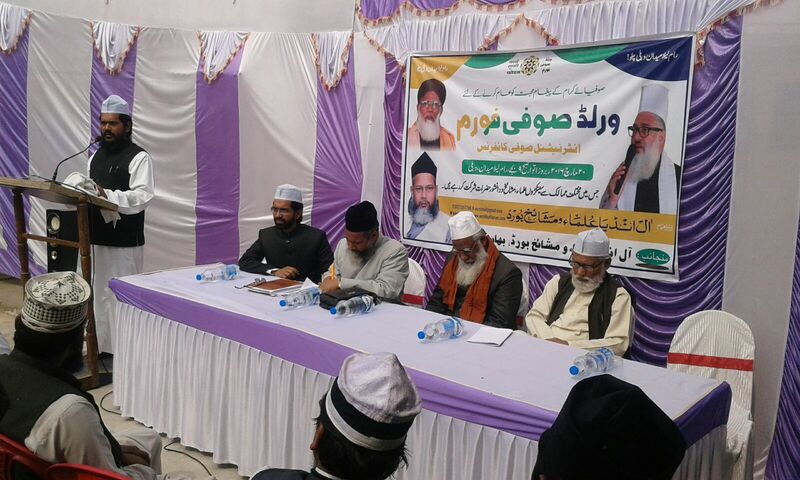 Among those who attended this meet were Hafiz Sabir, Muhammad Saleem Ashrafi, Hafiz Tatheer, Shahid Ashraf, Muhammad Shahid, Ali Imam Ansari, Muhammad Shahabuddin, Muhammad Azharuddin, Ezaz Ansari. Besides them, many others were also present in large numbers.